One of Wheeler’s unique features is its extensive trail system running through the 730-acre sugar bush. There are six trails, ranging from 1 to 7 km, and visitors are welcome to walk the trails for free year-round. In the winter, you can bring your own snowshoes or skis, or you can rent snowshoes at the restaurant for $5/pair for 2 hours. Two of the trails are stroller-friendly when there’s no snow, and one of the trails has a wheelchair-accessible boardwalk through a wetland and beaver pond. Dogs are welcome on the trails, provided they are leashed and you pick up after them. While walking to the trails, you may come across the free-range sheep. The last time I was there, they were hanging out at the small barn, with their other sheep friends who were stuck behind the fence. The free-range sheep were very interested in our dog, keenly watching him and not running away as we walked past (we kept a good distance though). There are also two Scottish Highland steers on the property. In the winter, they stay in the barn area with the sheep, and in the summer, they’re in a field close to the road. In addition to the trails and farm animals, Wheeler’s also has two museums. The first is the Maple Heritage Museum, housed in a beautiful log building beside the restaurant. This museum is said to have the most extensive collection of maple artifacts in the world. You’ll see an amazing variety of spouts, sap buckets, sugar moulds, and sap tools, and a really beautiful collection of antique glass syrup containers. There are also old photos of maple syrup production, and a display showing how First Nations people made maple syrup. There is also a chainsaw museum in a building near the sheep barn. I have never seen this museum myself (I think it was closed when I was there), but make sure to ask about it if you enjoy looking at antique machinery. With all this walking and touring, you’ll probably be hungry for some pancakes, so it’s time to head over to the main attraction: the gorgeous Canadian Lodge Style restaurant. Made from huge cedar logs reclaimed from century-old barns, the restaurant fits beautifully into its surroundings. During the maple syrup season, you may even have a view of the sap running through a tube outside your window. The restaurant provides table service – no cafeteria-style ordering here. We each ordered a pancake, one piece of French toast, and 3 maple sausages. I was a bit shocked at the size of the pancake when it came out; it had to be at least 4 times bigger than normal! As we poured copious amounts of maple syrup on our meal, we laughed about how eating pancakes is just an excuse to eat dessert for dinner. Feeling jumpy yet sleepy from the carb and sugar rush, we paid our bill and headed home. And this is where I learned a good lesson about the Lanark Highlands: do not rely on your cell phone. After developing a sudden flat, only to find that our spare tire was also low, we found ourselves with no cell service and 15 km from the nearest gas station. After limping the car to the highest point we could find, we were finally able to catch a signal and call CAA. 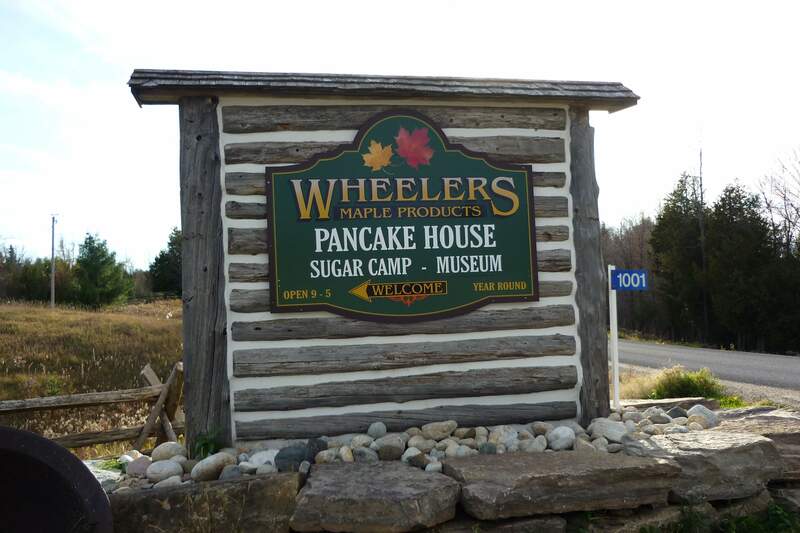 Thank goodness we ate that big pancake meal at Wheeler’s, because it was 9pm before we finally made it home. Arriving in a blaze of emergency lights, we unloaded the car and freed our dog from the backseat – surely his most exciting car ride yet.